The medicinal effect seems to be being said, "It is the stomach and intestines disease none in house with the tomato" or "When the tomato reddens, the doctor becomes blue" for a long time large. A lot of potassiums, carotenes, and vitamin C, the vitamin B family, quercetin, and lycopenes, etc. are contained in the tomato. In the Chinese medicine, it is thought that the tomato purifies blood, and helps the digestion of fat. The organic acids such as the fact, the citric acid, the malic acid, tartaric acids, and the succinic acids urge the secretion of gastric juices and the digestion is promoted. Moreover, alkaline minerals of sodium, calcium, magnesium, and potassium, etc. neutralize the acidosis. Working of potassium is working that excretes sodium in the inside of the body, and lowers blood pressure inevitably. The mental illness and arteriosclerosis are prevented with [keseruchin] that makes the blood vessel strong, and the skin is cleaned. Quite a lot of carotenes (vitamin A) and vitamin C, vitamin B family, and vitamins P(rutin and flavone) are said the vegetable with generally a lot of vitamins to the tomato. It is effective in the prevention of high blood pressure and the hemorrhage of the eye ground by the blood vessel reinforced action and the dilator effect of these vitamins. 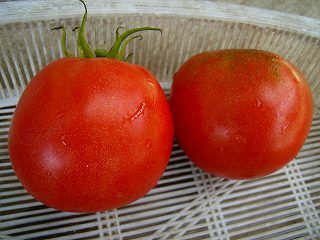 There is one kind of lycopene about the carotene (carotene and carotenoid), and it is included in the red tomato used for the juice and catsup, etc. a lot. The lycopene is a coloring matter that makes red, has the antioxidative effect, and has working that erases the active oxygen. I think the immunity is strengthened, and it is effective also for the prevention of cancer. Moreover, I think that it is also good to boil and to make catsup of the lycopene because it is strong also in heat. The acidity of the tomato tunes the condition of the stomach in the organic acids such as the citric acid, the malic acids, and the succinic acids, and there is working that removes the tiredness material such as lactic acids, too. The smell element of pyrazine of making blood a whispering is included in the tomato. The pyrazine is a peculiar smell element included in the leek, parsley, the onion, and celery, etc. , and has working that controls the coagulation action of the blood of the platelet. In a word, there is an effect of being not able to make the thrombus easy to do, and it is effective for the prevention of arteriosclerosis. There are a lot of one kind of glutamic acid of of the amino acid tomatoes, and moreover, good increases by the synergy effect with the amino acid of the inosinic acid and the tomato included in the fish, and it becomes very delicious if it cooks it with the fish. Moreover, [takeshinou] is effective in the glutamic acid and the aminobutyric acid. Naturally, because one kind of tomato of the vegetable contains a lot of pectins of the dietary fiber, it regulates the functions of the intestines, and the improvement and the constipation of the cholesterol level are very useful. When the grape tomato is seen in nourishment, carotene and vitamin C are more abundant than a usual tomato. Contents of minerals such as potassium, iron, and zinc have increased, too. Reds are stronger than usual tomatoes, and the content of the lycopene has increased, too. However, the taste and the texture seem are delicious a usual tomato. Note the overeating of the tomato. If a lot of tomatoes are eaten too much in the life, the person with the cold constitution and the person to whom stomach and intestines are weak occasionally become bad the physical condition. Let's heat by boiling when a lot of eating because there is an action that cools the body in the tomato. Uncommonly, there is a person of the tomato allergy and, in that case, take care, please. It never worries about a person safe no matter how it eats so. I am safe though it is said by me that the eggplant and the cucumber also will cool the body no matter how it eats. Moreover, there is not growing fat even if a lot of eating because the calorie of the vegetable is a little in general. I might be embarrassed with disposal it is not possible to eat because it catches the amount of throwing away in the farmer at the harvest time of the tomato. In this case, when the tomato is boiled, it is possible to preserve. Afterwards, it is convenient to use it to cook when making to subdivision and making it to freezing. I think that you may boil and make catsup of vitamin C of the lycopene and the tomato because it is strong also in heat.